A Cure for Poker Fever? Thanks to the beautiful wobbly tilted pokers and cherrywoods posted on here lately, my PAD is flaring up again. Gotta luv it when that happens. I've got a fever and the only cure is more pokers. Those are both good looking pipes. Now I may have to go searching. awesome meer! That "MOD" will look great once the color sets in. Very nice guys. You guys are making my PAD flare up again as well. Thank! It says PM 2012 on the other side of the shank. I've only smoked it a handful of times. I have to smoke outside, and it's been really cold out. I don't want to risk cracking it. Nice find. That is a beautiful pipe! Nice pipe! I was watching that GBD myself. Glad to see it went to a good home. Great looking GBD, congrats on your new pipe. I hope it is a great smoker for you. Good looking Jeremy. Like it a lot. Really like the rustication on that GBD. The title begs for an off color joke, but I liked the GBD so much I didn't have the heart. I'm glad your yearning has been temporarily cured! Great looking GBD Jeremy! Also awesome one of a kind PM Meer Ben. Great purchases guys! this GBD Rusticated 1/8 bent Poker finally arrived. Clean as a whistle, and fresh as a daisy. markings are "GBD TABOU St. Claude 1444S"
Nice and light. We'll see how she smokes. Pokers are lovely in their simplicity. One of mine is a LaRocca with a good big deep bowl and narrow metal band. Recently I saw a Parker in sandblast black. irregularity, which I also especially like. 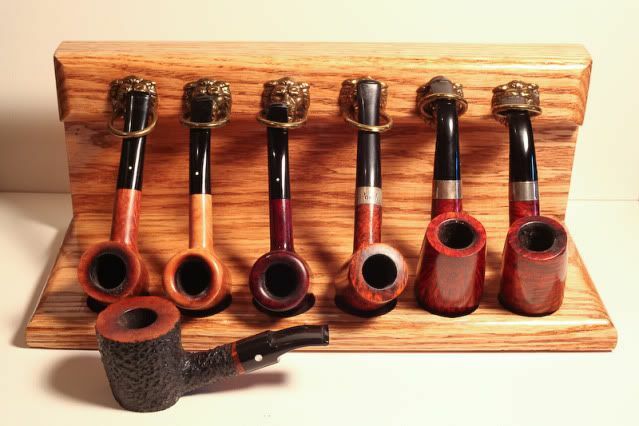 Every pipe rack needs a resident poker.